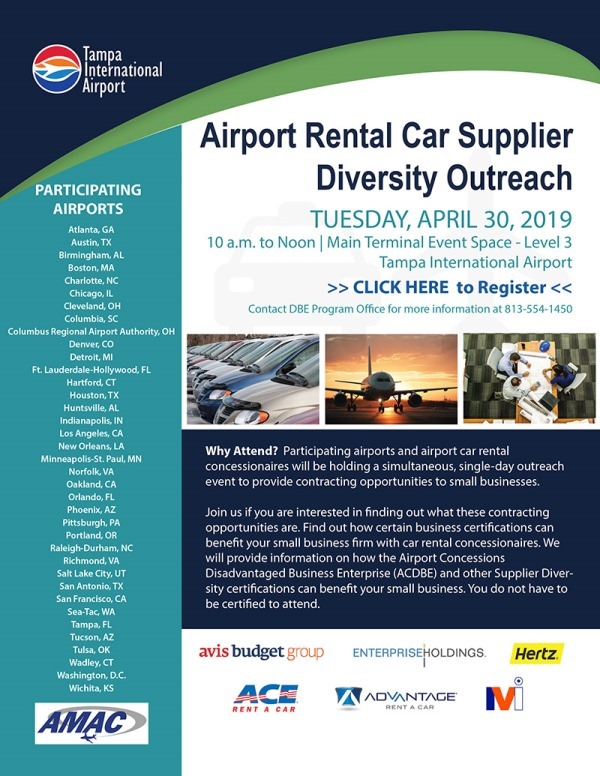 The Procurement Department is responsible for the acquisition of all goods and services in support of the operations of Tampa International Airport and its three general aviation airports. We operate our procurement processes in accordance with the Authority procurement policies and procedures, the Florida Sunshine Law and a Cone of Silence to ensure fairness, competition and best value. The first step in seeking business opportunities with the Authority is to register as a supplier in Supplier Portal. When you register you should select applicable NIGP codes that identify the functions that your company performs. Courtesy notifications of advertised bid opportunities will be emailed to registered suppliers. Supplier Portal is used to obtain pricing for goods and services and collect basic information on potential suppliers to facilitate greater supplier diversity. The Supplier Directory located on the Supplier Portal page can be used by businesses seeking to partner with each other as prime contractors or subcontractors. Click here for more information and to register, Supplier Portal Information. Periodically, the Aviation Authority disposes of surplus equipment and supplies as well as Lost and Found items that have not been claimed by their rightful owner. All Lost and Found articles not claimed by their rightful owners in accordance with appropriate procedures are sold through Bay Area Auction Services. For details and to view the items available for sale, visit Bay Area Auction Services. Surplus equipment items are sold through GovDeals. For details and to view the items available for sale, visit GovDeals. Surplus items such as heavy machinery and vehicles are sold at Tampa Machinery Auction. For details and to view items for sale, visit Tampa Machinery Auction. Computer equipment is donated to organizations within the Hillsborough County School system.